Our bridal specialists use only the finest hair and make up products so you will look and feel your very best on your wedding day. We also provide on site wedding day hair and makeup, so you can relax in a comfortable environment. We will be happy to meet with you to discuss the details of your special event, and wedding hairstyles. We pride ourselves in having the knowledge and experience to ensure your day is truly unforgettable. 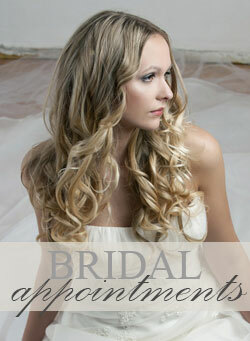 Make an appointment with our bridal specialists today.